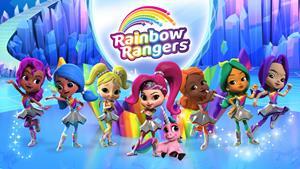 BEVERLY HILLS, Calif., Dec. 17, 2018 (GLOBE NEWSWIRE) -- Following on its strong November 5 premiere on Nick Jr., reaching #1 Kids 2 – 11 and Girls 2 – 5 in its third week on air, Genius Brands International’s "Genius Brands" (NASDAQ: GNUS) new animated adventure preschool series, Rainbow Rangers, will be heading to the live stage following a rights acquisition deal for live touring shows by diversified entertainment production and marketing agency Gershwin Entertainment, founded by industry veteran Todd Gershwin. The live theater production debut of Rainbow Rangers is timed to coincide with the preschool brand’s U.S. retail launch in 2019. The announcement was made jointly by Genius Brands’ SVP of Global Licensing Lloyd Mintz and Gershwin. With Rainbow Rangers delivering impressive ratings on Nick Jr., and with the licensing program launching with over 300 product SKU’s at retail across the U.S. for back-to-school/holiday 2019, licensing industry insiders are forecasting that Rainbow Rangers will be among the top ‘must-have’ consumer products’ franchises for children of all ages throughout the latter half of next year and beyond. The Rainbow Rangers series follows the thrilling rescue-based adventures of seven 9-year-old girls who are Earth’s first responders, protecting people, animals, resources, and the natural beauty of our world. The Rainbow Rangers, who live in the magical land of Kaleidoscopia at the other side of the rainbow, have their distinctive personalities and superpowers. Whenever there's trouble for the people or animals of Earth, our seven heroines zoom into action and ride their Spectra Scooters across the rainbow to save the day. Viewers will join them on exciting adventures but also see them at home having the same daily dramas and hilarities as every preschooler watching the show. And at its heart, Rainbow Rangers is about empowering and encouraging girls to take action and make a difference in their own homes and neighborhoods to improve and safeguard the planet. Every viewer—boys and girls alike—will see themselves in at least one of these strong, unique and empowered Rangers! Gershwin Entertainment is a diversified entertainment production and marketing agency founded by industry veteran Todd Gershwin. Gershwin Entertainment specializes in producing live events and theatrical tours, with a specialty in family entertainment. Gershwin has developed and produced successful theatrical productions, concerts, and tours for numerous iconic brands. Current North American touring projects include A Charlie Brown Christmas, Rudolph the Red-Nosed Reindeer, PBS Kids Live, Rainbow Rangers, Tony Award-winning Broadway hit musical Million Dollar Quartet, American Rhapsody and A Night with Janis Joplin. Gershwin’s projects have played at leading venues throughout North America including Madison Square Garden, the Hollywood Bowl, Ravinia, Wolf Trap, Arena Stage, the Pasadena Playhouse and numerous Broadway theaters.